The Wadi Tumilat is the easily visible green branch stretching East from the Nile Delta to Lake Timsah and the larger Great Bitter Lake below it. Most monuments from Egyptian antiquity are grand, conspicuous, stone-made, and thoroughly impractical. The Wadi Tumilat, a defunct Nile distributary branching East from the delta, boasts no such monuments. In ancient times it was a vital part of the Canal of the Pharaohs, a major feat of ancient civil engineering that linked the Red Sea to the Mediterranean via the Nile. 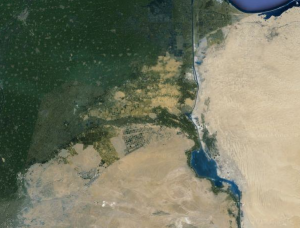 Today the waters of the Wadi Tumilat are mostly used for irrigation, though a trickle does arrive at lake Timsah where it enters the modern Suez Canal. The favored route in ancient times (see map below from Wikipedia) largely coincided with the current route south of Lake Timsah to the Red Sea, but from Lake Timsah it turned West through the Wadi Tumilat to join the Nile near the base of its alluvial fan. canal had been dug as I had ordered, ships went from Egypt through this canal to Persia, as I had intended.” Greek and Roman authors would later claim that earlier Pharaohs such as Senruset III, who ruled from 1878 BCE to 1839 BCE, had at least begun work on the canal, though their efforts may have been unsuccessful. Both the Ptolemys, who ruled Egypt from 305 BC to 30 CE, and the Roman emperor Trajan, who ruled from 98 CE to 117 CE, are credited with repairing or re-digging the canal. 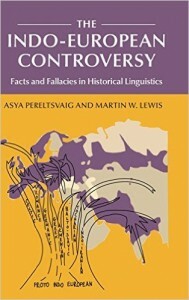 The canal silted up due to neglect during the late Roman and Byzantine periods, but was reopened by Egypt’s Islamic conqueror Amr ibn al Aas by 642. The canal was closed for good in 767, ostensibly to cut off supplies to the rebellious cities of Mecca and Medina. A new Suez Canal using a revived Wadi Tumilat almost became a reality in the early 19th Century. 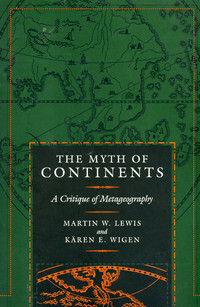 Napoleon was fascinated by classical authors’ descriptions of an ancient canal linking the Mediterranean to the Indian Ocean, and felt that control of such a waterway could allow France to supplant the British Empire as the dominant European power in India, with all the lucrative trade that entailed. 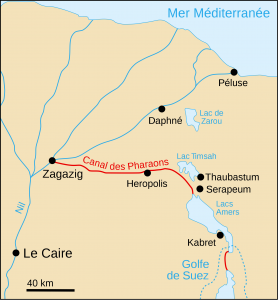 Between 1798 and 1799, Napoleon’s top engineer Jacques-Marie Le Pére and his team traced the ancient canal from Suez up through the Wadi Tumilat to the Nile. Unfortunately for Napoleon’s aspirations, a mathematical error led Le Pére to conclude that the Red Sea was 8.5 meters higher than the Mediterranean, and that a new canal through the ancient route would be inadvisable. It is difficult for us to appreciate the difficulty inherent in digging and dredging a canal without modern technology or even tools we would recognize as proper shovels. The Nile River’s famous silt, once the foundation of Egypt’s prosperity and now blocked by the Aswan Dam, would have been of a curse for canal navigation on and beyond the Wadi Tumilat. Workers in the deserts of Suez would likely need to have all of their supplies brought in from quite far away. So the next time you see a lone green line of the Wadi Tumilat branching off the Nile Delta, remember that the ships that once passed through it were as great a monument to Egyptian ingenuity as any obelisk or pyramid.